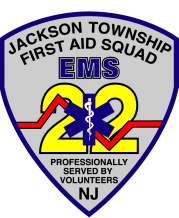 The Jackson Township First Aid Squad is a registered 501(c)(3) tax exempt organization that provides ambulance service to the Township of Jackson between 6pm and 5am, 365 days a year. The over 60 volunteer members of the Squad answer nearly two thousand calls a year in every part of town. We welcome your support, and gratefully accept donations.